You may practise your Russian while shopping, in the market, cafes, and restaurants, when visiting Riga Russian Theatre, in the street and at school. Our school is located in Baltic International Academy(BIA) http://bsa.edu.lv so during the brakes between classes you will be surrounded by a friendly Russian-speaking environment, which will give you the opportunity to communicate with other students in the cosy café and the recreation zone. This will help you improve your speaking skills and communicate more easily and effectively. Our teachers are native speakers of Russian and authors of popular textbooks of Russian as a second language. They are friendly, cheerful and experienced professionals who love their job. You will soon discover that our teachers are caring and patient and will ensure your lessons are effective. We offer you short-term and long-term intensive courses at different levels of Russian, from beginner to advanced. Small groups of maximum 7 participants guarantee an individual approach to every student. We try to use every new opportunity to improve our teaching. You therefore learn Russian with the help of the most up-to-date and effective methods available. 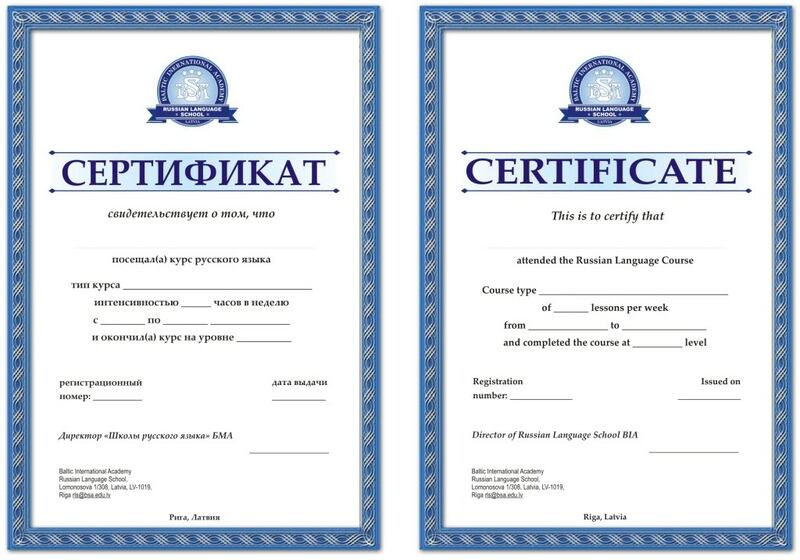 On completing the course, you receive the end-of –the-course school`s certificate. Also, you may pass the additional exam if you want and you receive the TRKI or ECL ("European Consortium for the Certificate of Attainment in Modern Languages") certificate! (Link: BIA: ECL). We offer you a bonus class in BIA library or BIA Russian Centre. Learn Russian with us, and you will understand that it is easy and fascinating! Best Russian language courses in Eastern Europe, Latvia, Riga. No VISA required. We offer cheapest prices and unique methods of learning Russian language. From beginners to advanced level! Improve your Russian with us!